It’s National Chocolates Day, in these United States. An often wished for super power would be the ability to simply become invisible, or undetectable by casual observers. Since that won’t happen, barring some revolution in technology based camouflage, one instead skulks around in plain sight. To be seen by so many diminishes me. The new NYC Ferry service has really been occupying a bit of my skulking time of late, and it has increased geographic range quite a bit. They don’t exactly advertise it, but if you buy a ticket on… say the Astoria Line… you can go the onboard snack bar and request a transfer ticket to get on one of the other lines. This essentially makes it entirely possible to get to Rockaway from Western Queens for only $2.75 by water, which kind of rocks. Generally speaking, I’m on boats doing NY Harbor or Newtown Creek tours all summer long, but in recent years I’ve been tethered to the microphone while narrating the event and seldom get a minute to wave the camera around anymore. Whereas I literally “love” this sort of tour narrator occupation, it’s been really nice for the last few weeks to keep my mouth shut and just get down to shooting whenever I’m out on the water. Just east of the Verrazano Bridge, this little quartet of working vessels was recently observed. From the left, that’s a Miller’s Launch work boat, the Scott Turecamo tugboat, the New Hampshire fuel barge, and the cargo ship is the Nave Ariadne fuel tanker. One has not exactly been shooting a lot of tugboats during the last year, as I’ve grown somewhat jaded to the splendor of the maritime industrial scene in recent months. 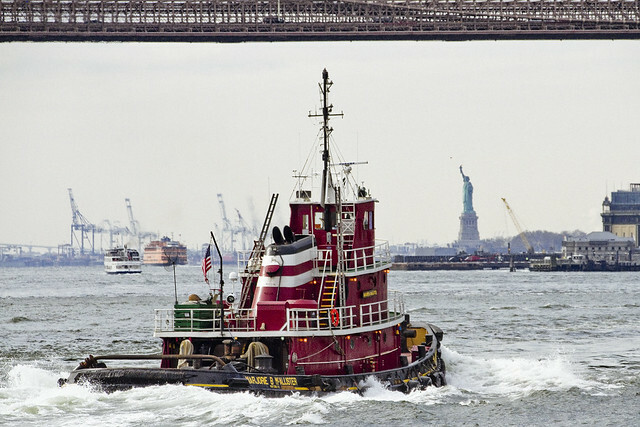 There’s only so many ways you can frame a tugboat in your shot, after all, but I just couldn’t resist the view of the Marjorie B. McAllister tug in the shot above as it transited beneath the Brooklyn Bridge with the Statue of Liberty off in the distance. Personally, I find the Statue aesthetically pleasing. How often can you say that about a French woman who sports a 354 foot waistline as well as a four and a half foot long nose? A humble narrator has been known to kill an entire day in recent weeks riding back and forth on the new NYC Ferry, transiting between Rockaway and Astoria. 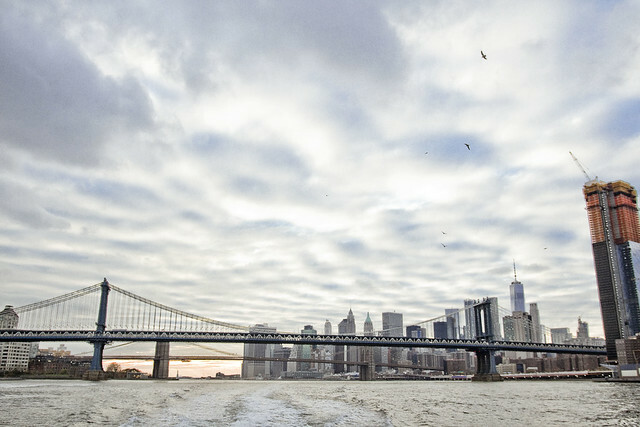 In subsequent intervals, one plans on actually debarking the boat at a few of its mid route destinations, with a visit to the dock at Sunset Park forming into a particular set of desires. Weather depending, sometime soon I plan on waking up early to do a sunrise transit to Rockaway. Then I’ll take the boat to Sunset Park and spend the late morning and afternoon scuttling about, followed by a setting sun trip back to Astoria. 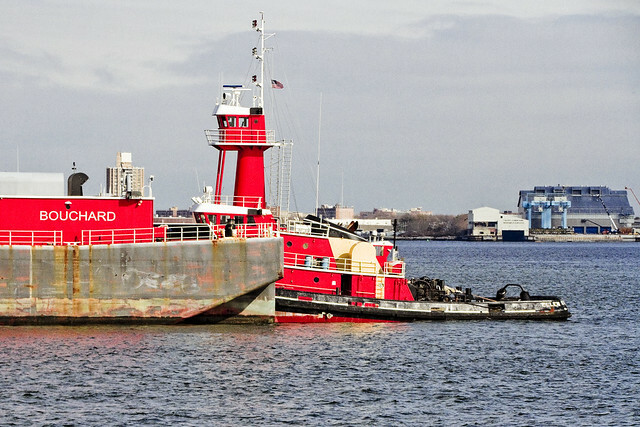 That’s a Bouchard tug spotted nearby Gerritsen Bay, just south east of the Verrazano Bridge. 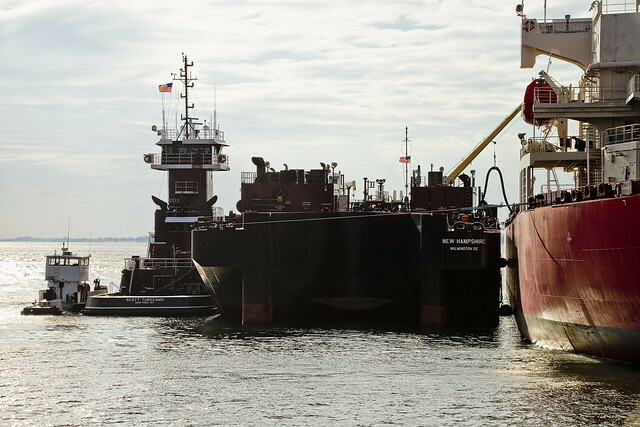 It’s an articulated fuel barge and tug, which means that there are cables full of electronic signaling equipment which run between the barge and tug in a “notch” engineered into the former, which the bow of the latter fits and connects into. It allows the crew to control the tug barge combination as if it was a cohesive and singular unit. As Bugs Bunny might have said: “dat’s Modern Design, ay?”. Something I get, a lot, is: “Dude, how do you remember all of this stuff? You’ve just got it in your head.” I can report to you that I know less than 5% of all there is to know, just along the East River. There’s corridors on the water – Newtown Creek for instance – that I know a LOT about, but even there there’s always something new to glean. 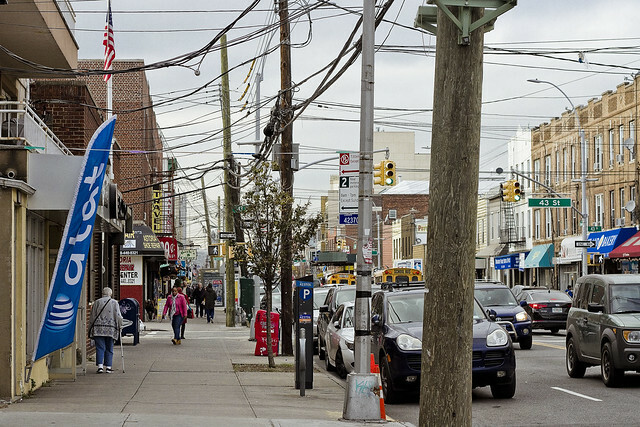 I’m still figuring out the block I live on in Astoria, after all. It’s been an odd few weeks here in the ancient village. The armies of chaos who transit through here on a regular basis have been shifting around a bit in size, character, and sort of late. Just heard a disturbing story last night which saw a female friend of mine show up at HQ with two black eyes, another last week from a local Pizza shop owner who found his shop in the middle of what he described as a “Mexican riot” at two in the morning, and large groups of teenagers have been riding bicycles together. Recently, I saw a baby who had one eyebrow that stretched from eye to eye right over the nose, and a pair of dogs who were wearing shoes and coats. I also saw someone walking a cat on a leash. The world is a scary place, but I’m ok because I’m hiding behind a camera where nobody can see me.